For the family of a child who cannot walk, living in a building with no elevators until the 10th floor – as is common in lower-income housing in Guangzhou – simply climbing the stairs to your front door can be a huge challenge. This is what a team of Canadian health workers encountered on their first trip to Guangzhou City as part of the Neurosciences Partnership Program, spearheaded by the Centre for International Child Health (CICH) and generously funded by the Fu Tak Iam Foundation. In a third floor, one-bedroom apartment, an immobile nine-month-old girl is cared for by her father and grandmother. The girl suffers from cerebral palsy (CP), an incurable condition caused by damage to the brain during pregnancy, childbirth or up to about age three. CP affects the development of muscles, motion, walking and speech, and usually becomes more evident as the child grows. The Canadian medical team suspects that the girl’s lack of mobility will lead to lifelong challenges. Her father is worried that her feet are always pointing down, and although she can roll around quite well, she is unable to sit independently or crawl. Her family, making the best of what they have, show the Canadians a simple umbrella stroller they have adapted using towels sewn onto the fabric and a thin pillow for her head so that she can sit up. The medical team is impressed by the device, and leave the family pondering how they can help. Children with disabilities from birth or early childhood face a lifetime of challenges resulting from a limited ability to move, learn or sense the things around them. There are profound implications not only for the children, but also for the families and communities in which they live. At the national level, neurodevelopmental disorders like epilepsy and CP contribute to lost human capital – the most important currency in developing and emerging economies. Many children in China, like the nine-month-old girl, do not receive proper care due to poverty, geographic isolation or the stigma associated with neurological conditions. To address this need, the Neurosciences Partnership Program brings medical specialists from China and Canada together to improve care for Chinese children with neurodevelopmental conditions through diagnosis and treatment, and the training of Chinese medical professionals. CICH forges global partnerships to help children and their families reach their full health potential, particularly those who are most vulnerable – the poorest and least advantaged in developing nations. To date, CICH programs have linked Canadian health-care workers to their counterparts in China, India, Bangladesh, Ethiopia and Uganda. The centre’s mission is to exchange knowledge, skills and practices that strengthen the capacity of its partners to reduce preventable deaths worldwide and to improve the health and well-being of children and their families. The baby girl from Guangzhou City is one of tens of thousands of kids with CP who may come to Guangzhou Children’s Hospital (GCH) – the largest children’s hospital in southern China. Every year, the GCH neurology and rehabilitation clinics receive about 125,000 patient visits. But for every child who comes to the hospital, there are many more who do not. Like GCH, BC Children’s Hospital – located in Vancouver and home to the CICH – is the only hospital in the province of British Columbia dedicated solely to children. The hospitals are united in their mandate to care for women and children, but despite their similarities, the difference in patient volume is great. GCH received 1.6 million outpatient visits in 2008; BC Children’s saw a fraction of that with just over 196,000 patient visits last year. Dr. Peter Wong, director of the Diagnostic Neurophysiology Department at BC Children’s Hospital, was astonished by the sheer volume of patients at GCH, with the hospital seeing in one or two months what BC Children’s sees in one year. “When we first visited their EEG (brain electrical activity) Department there was little similarity to what we were used to,” he says. “Instead of one patient to a room, it was three babies being rolled into the room in a cot, and each was having a different test! Since they have fewer neuroscience doctors, this means each doctor has to deal with many more patients each day.” The key to alleviating the workload at GCH, the Canadian health team believes, is not only giving families access to the care they need in their own communities, but establishing the trust that their child will get the same level of care in their home community. Guangzhou has nearly 1.7 million children under the age of 15, and the province of Guangdong is home to over 19.5 million children. According to the World Health Organization, China has about nine million epilepsy sufferers and the number increases by 400,000 each year. With such staggering numbers, a major challenge lies in providing service to all children in need, regardless of income, gender or where they live. Families throughout Guangdong who can afford to travel often choose to come to Guangzhou because of their lack of confidence in local providers. “Patients are drawn to GCH from all the surrounding areas on the basis of reputation, at great expense and trouble to the parents. In fact one of our main goals is to introduce more clinical expertise to outlying hospitals so as to reduce the burden on GCH and allow more patients to be treated in their own communities,” says Dr. Mary Connolly, head of the Neurosciences Program at BC Children’s Hospital and one of the doctors who has travelled to Guangdong from Vancouver. The number of caregivers and the quality of care available at the community level varies significantly between hospitals. As a result, many parents either do not seek help for their children or have to endure long waiting periods due to limited resources. Through the CICH project, medical professionals in four municipal and predominantly rural Guangdong district hospitals (Liwan, Conghua, Huadu and Zengcheng) are being trained with the goal that they will become trainers themselves and continue to train other professionals in treating childhood epilepsy and CP. “We need to build confidence, so that families feel their children will be served well even if they’re not in the provincial centre,” says Dr. Larson. In the smaller hospitals, problems often arise when the scanning tools are not used properly. Something as simple as an ungrounded electrical outlet can render a CT or MRI scan useless. Or if, for example, the EEG room is not soundproofed, environmental noise can interfere with the test results. Such limitations in a rural hospital environment are hard to avoid and difficult to identify without a visit to the area. One issue the team has been able to address is the need for better patient records. These are needed to draw on data for follow-up and subsequent care. The existing design of the patient database system does not allow doctors to easily manage the information. And the huge volume of patients makes it ever more difficult to sort or analyze the trends in care to make improvements. The teams from GCH and BC Children’s Hospital have begun to devise ways to help families get the care and equipment they need for their children while keeping costs low. Many families of children with disabilities cannot afford to buy the equipment their child needs and must use what is already available. A baby stroller fitted with support, like the one used by the nine-month-old girl seen by doctors during their first visit to Guangzhou, could easily be used by a six-month- to three-year-old without even looking like the child has a disability. This stroller could be adapted at a low cost via “kits” distributed to families. Last year, two neurological specialists, a physiotherapist and a developmental pediatrician from Guangzhou trained for three months in Canada and several more trainees are scheduled to arrive in 2010. 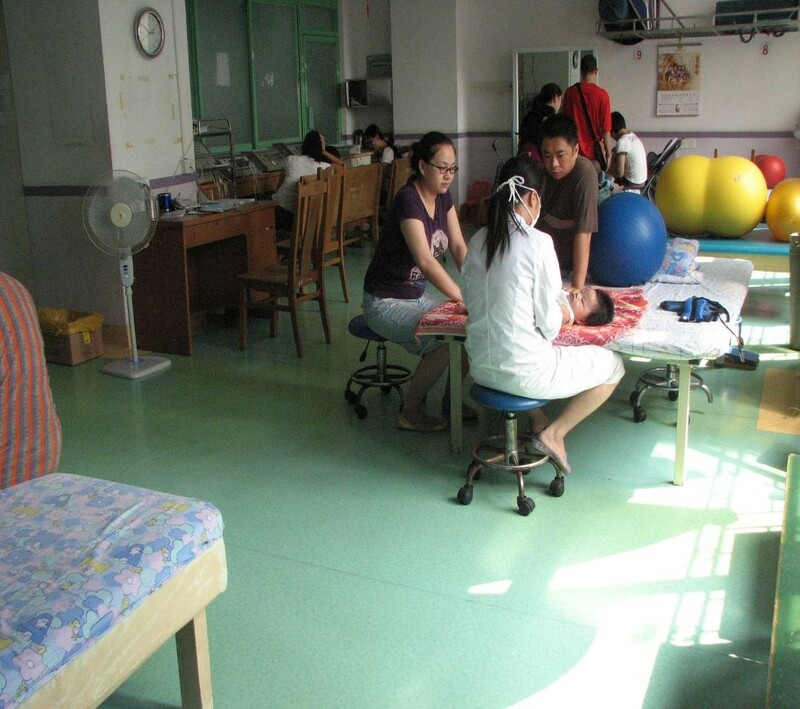 Plans are also in place for BC Children’s Hospital caregivers to continue to make regular teaching trips to Guangzhou. After two years, by the conclusion of this project CICH expects to have set GCH on the path to devolving health services for children with epilepsy or CP closer to families’ homes. The hope is that this can serve as a model to be replicated by other GCH specialty services. In order to achieve this aim, the project will have 1) trained GCH staff as trainers of health professionals in lower level health facilities, 2) assisted in the development and implementation of the training curricula, 3) tested and implemented evidence-based clinical practice guidelines, and 4) supported the adoption of an alternative health delivery model that eliminates barriers to the devolution of care.